The Dark cave is an adventurous and action-packed experience. Visiting this cave includes harnessed zip lining over a turquoise river, swimming into the mouth of the cave (life jackets included), walking through the dark with only the head torch on your mining helmet to illuminate the way, having a mud fight in the buoyant mud baths deep in the cave, washing clean with a swim in the lake inside the cave, then kayaking back across the river to test your strength on the hanging obstacle course and open ziplines. The Dark cave is named as such because it is one of the few caves that has had no artificial lighting installed. The cave is comprised of mostly basalt, in addition to limestone. Basalt is a black, hard rock; also contributing to the cave's name. With this rock surrounding you, you squish through the narrow and muddy passage using only your headlamps to illuminate your path. 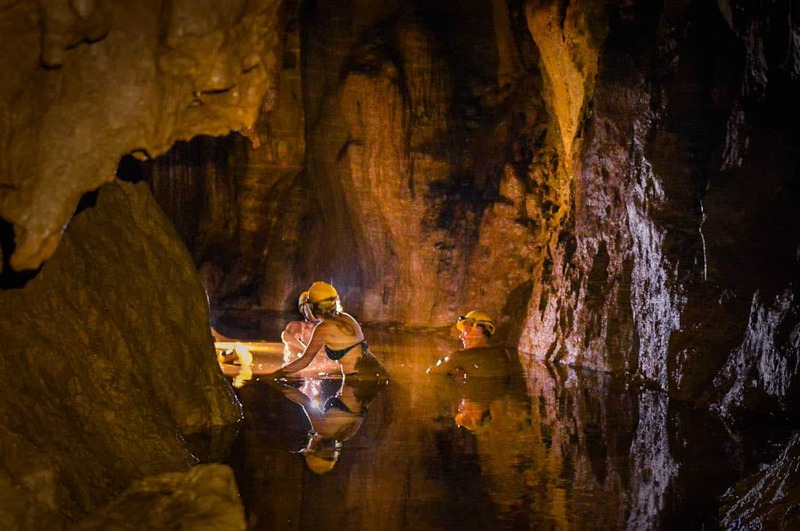 Paradise cave is the longest dry cave in Asia (located in Phong Nha – Ke Bang National Park's core zone. With naturally primitive features, Paradise Cave looks like a landscape painting; making it a natural wonder that many have enjoyed since its opening in 2010. According to spelunkers (cave explorers), the deeper one journeys into the cave, the more one feels the wells of heavenly clarity all around. The cave height can reach to 72 m and up to 150 m wide. There are a series of white crystal stalactites (limestone deposits) resembling natural pillars and many other spectacular formations. 08:45 - You will be picked up at hotels in then exploring National Park core zone and Paradise cave - the longest dry cave in Asia (located in Phong Nha - Ke Bang National Park's core zone, 25km about Phong Nha cave, 75 km about Dong Hoi and 1h20 minutes driving) at the rest of the day. cave and then washing clean with a swim in the lake inside the cave. 17:30 Get back to hotel.